Remember feeling the excitement of witnessing the instant when tiny little feet take their first steps? From the moment of this important first developmental milestone, our kids will manage to find their footing, gaining countless steps as they go along acquiring new skills. When two little feet are ready for next level fun, its time to roll with beginner scooters designed for little ones. First scooters are constructed with a sturdy frame and handlebars, with three high quality wheels for better balance and stability for smaller kids developing coordination abilities. 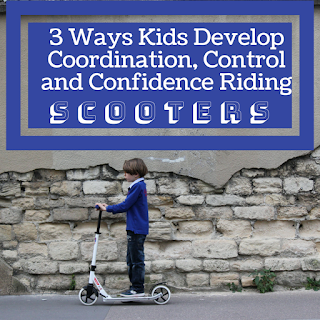 Fun and fitness go hand-in-hand as exercise helps kids develop coordination, control, and confidence while riding scooters. Thank you to Razor and their promotional team for the courtesy of providing promotional product for editorial content purposes. The Razor Jr. Lil’ E provides the extra stability of three wheels and a simplified push-to-go, soft start throttle that keeps them in control as they explore the thrills of electric-powered fun. 1- Choose a beginner ride-on scooter made with three sturdy wheels for safer riding, easier turn management, and decreased potential for tipping over while scooting about on different terrain types. Scooters with larger wheels provide optimal stability for building core muscle strength and balance control while riding. 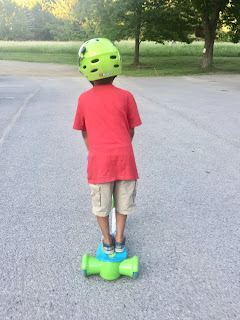 My son progressively learned the gross motor skills necessary for riding a scooter first on an electric scooter, before mastering a traditional two-wheeled scooter. 2- Look for a wide, slip-resistant scooter deck plate, providing adequate footing space for little feet. 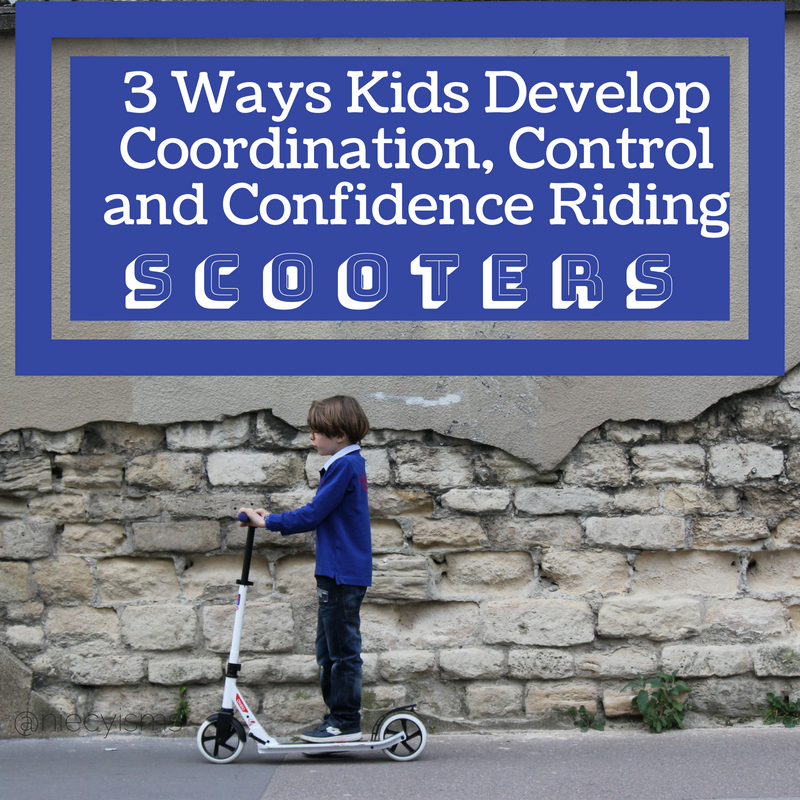 Giving kids the advantage of selecting a scooter with three wheels, as opposed to traditional two-wheeled scooters, the wider area of the standing platform, the more stable the scooter will be for learning to ride before transitioning to classic scooters. Balancing on a sturdy deck gave my son the confidence to ride without an overwhelming fear of falling off of the scooter. 3- Always test the efficiency of the scooter's handlebar steering and braking system (if applicable) for ease of control by little riders. Most basic first scooters are simple for younger kids to gain the coordination needed to steer and stop the scooter without the need for assistance, however, adult supervision is required at all times as a safety precaution. As always, kids should wear a safety helmet, proper footwear, and any necessary protective safety gear while using extreme caution detailed in the owner's manual when riding scooters. 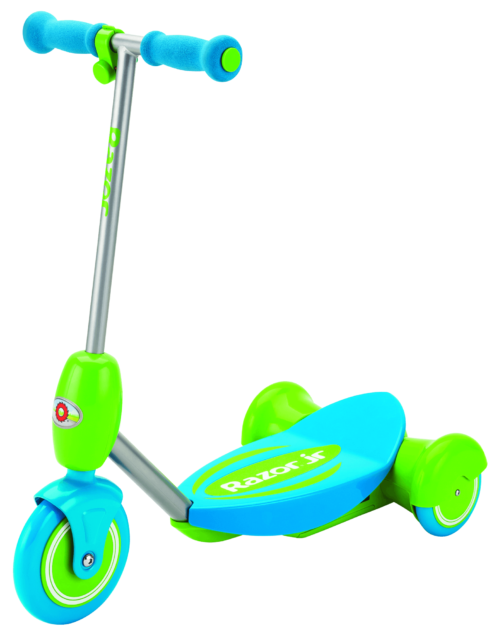 Find the Razor Jr. Lil' E Electric Scooter and other Razor products online and on Amazon (affiliate).